Are you feeling anxious, overwhelmed or like you just have too much to do? Are you too busy to have fun? Always behind on projects at work? Do you forget to respond to emails from your friends and coworkers? Forget to send birthday cards? Feel like you are running around on a hamster wheel? Too busy to take the time to get organized?Are you STRESSED?If you can relate to any of the above feelings then I have something for you! 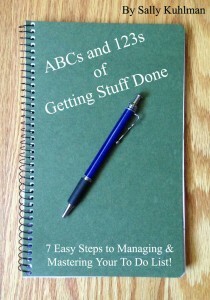 I wrote the guide to the ABCs and 123s of Getting Stuff Done! This booklet is only 10 pages long and can be read in less than 10 minutes and can CHANGE YOUR LIFE! I’m not kidding. Just give me 10 minutes of your time and you will be on the road to feeling less stressed and more productive! I work with nonprofits, entrepreneurs and small business owners helping them to get organized and be more productive. In the year 2000, when I was working in the corporate world and feeling totally OVERWHELMED I signed up for a Franklin-Covey workshop on being more productive. That was the beginning of my lifelong quest to master the art of productivity. I have taken many workshops and have read endless books on Time Management and productivity. All of the systems I studied were great, however some are very expensive and others are very complicated. I’ve taken bits and pieces from each and have come up with my own simplified system for being more productive and less stressed. The system is simple and it only takes 10 minutes a day. What do you have to lose? I’m selling this idea for only $1.99! Why so cheap? Well, because the book is only 10 pages long and I didn’t think you would pay more. AND I really want to share this idea with you. You might ask, why am I not just putting the information out on my blog for free. Well, you know why? Because I have found if people pay for something, even $1.99, they are more committed. And who is going to read a 10 page blog post anyway? If you are ready to take the plunge and commit a whopping $1.99 and 10 minutes of your life, click here to purchase.